If you are looking for an affordable Bluetooth speaker in the market right now, chances are that you have come across a lot of options. You can go for a small, compact speaker like the JBL Go 2 which lets you listen to your music on the go, or pick something like the UE Boom 2 that offers really good audio and an IPX7 rating but isn’t as easy to lug around. Multiple manufacturers have tried to design a good Bluetooth speaker that is compact, offers good audio quality, and does not break the bank. 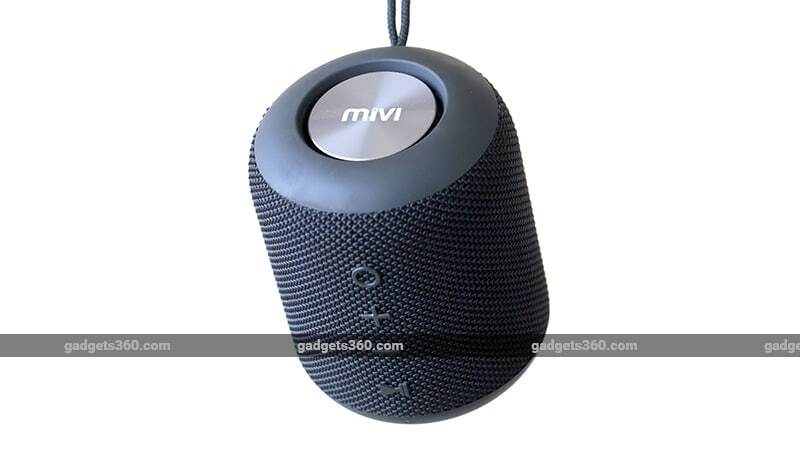 At first glance, the Mivi Octave looks like a shrunken Apple HomePod. It has a cylindrical shape with woven fabric around the sides. The top and the bottom of the speaker have a matte plastic finish. There is a shiny bass radiator on the top with a Mivi logo, slightly recessed into the body. The bass radiator does not have a protective cover so you will need to be careful to prevent damage to it. Mivi offers the Octave in grey and black colour variants, and we had the latter for this review. The Mivi Octave is light and has a lanyard attached to it, making it easy to carry. There are four buttons on the device — power/ pairing button, volume up & down, and a play/ pause button. These are made of plastic, and we felt that the quality could have been better. Just below the buttons is an LED that shows the current state of the Bluetooth speaker. This LED blinks when the speaker is playing audio and is steady when it isn’t. 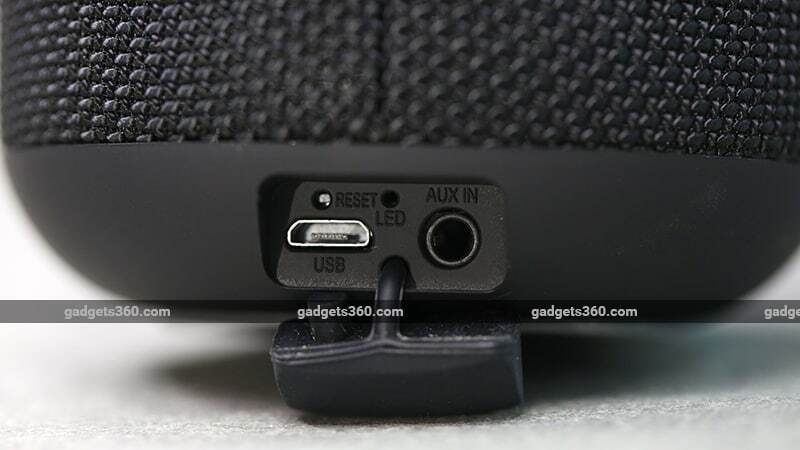 There is a flap near the base of the device that covers the Micro-USB port, 3.5mm audio input, and a charging LED. You’ll also find a reset button here. The base of the speaker is made of rubber to ensure that it does not move while playing audio. Mivi ships a 3.5mm aux cable in the box along with a Micro-USB cable for charging. The speaker has an IPX5 rating which means that it will be able to withstand water splashes to some extent. The Octave has two audio drivers and a passive subwoofer with a combined rated output of 16W and a frequency response range of 20Hz-20,000Hz. It supports Bluetooth 4.2 LE. The Mivi Octave weighs 318g and has a 2600mAh battery. While the box of the Mivi Octave states Rs. 4,000 as the MRP, the official website as well as Amazon have the product listed at Rs. 2,999. That puts its in the same price segment as the JBL Go 2. However we did notice that the Mivi Octave can get louder than the JBL Go 2. After listening to a few tracks, it is apparent that the Mivi Octave does not have the typical V signature. It felt a lot like a flat signature with only slightly boosted lows and highs. This Bluetooth speaker can get loud, but we preferred listening to it at around the 60-70 percent volume level. At this volume, the audio is decent but not as warm as with some other speakers we’ve tested, such as the UE Wonderboom. The Mivi Octave makes the most of its two drivers and is capable of providing stereo output. We were able to test this by playing Focus by Hocus Pocus on Apple Music. With the volume cranked all the way up, we were happy to hear that the highs were in check and didn’t sound too shrill. However, the bass overpowered the mids and highs, leading to distortion. To test whether high-quality audio made a difference to the output, we played Hotel California on the speaker while it was connected via Bluetooth to a MacBook Air. There was a noticeable difference in the audio quality while streaming the song on YouTube, versus playing a FLAC file. We tried the same test again, with the speaker connected to the laptop using an aux cable. The audio quality was better with the aux cable, with clearer vocals and more bass, when compared to Bluetooth. You can control the volume of the Mivi Octave independently when it is connected via the aux cable, but it syncs the volume control with the connected device when using Bluetooth, much like other speakers. We tried using the Mivi Octave as a speakerphone but our callers complained that we sounded distant, needing us to move closer to the speaker. Since the Mivi Octave sports a big battery, we could listen to it for quite a while before plugging it into the mains for charging. After listening to songs for close to four hours and then using the speaker for an hour to watch Mirzapur on Amazon Prime Video (at 70 percent volume throughout), 40 percent of the battery capacity was used. The Mivi Octave offers decent audio output as long as you aren’t blasting it at full volume. It has a good sonic signature and is loud enough to fill a small room. The bass is overpowering at higher volumes, but this is common among Bluetooth speakers at this price range. As long as you don’t use the Octave as a speaker phone, you will be happy for what it offers at its price of Rs. 2,999.